This is the view from my desk. 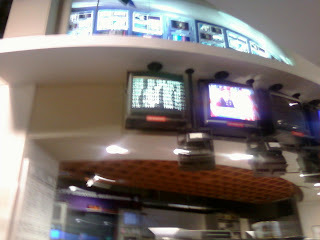 Those TV's line the top of the assignment desk area. The red signs under them denote which station they are tuned to. Those two on the left are tuned to our CNN feed, so we can borrow video from them whenever we need to. The others are tuned to local stations so we can keep an eye on the competition. Don't worry--they do it, too. Today is Monday (as you likely know--hope I didn't surprise anyone with that announcement). Mondays are a little melancholy for me because it's basically the end of my weekend. I really have no reason to feel this way; most members of the working world only get Saturday and Sunday (and sometimes not even that) to recuperate from a tiring week. But--and I am going to complain now--Tuesday is beginning to feel like Doomsday. I hate waking up early and I hate driving so far to work. Let's do a little math. The average adult needs about eight hours of sleep a night in order to function at optimum capacity. I wake up at 4:30 on Tuesdays and Thursdays (and this time is non-negotiable). Which means, I should be going to bed at 8:30 on Mondays and Wednesdays. But any normal person knows this SIMPLY ISN'T POSSIBLE. For one, 24 is on at 8 (hello!) and I refuse to miss it. Maybe my priorities are a little off, but as of now, Jack Bauer supercedes sleep. And also, 8:30?? Come on. I bet the last time you went to bed at 8:30, you were six. And you probably stared at the ceiling for an hour before you fell asleep. I have things to do, people. A kitchen to clean. A hubby to kiss. A diaper bag to pack. Blogs to write. The solution: I feel a little like a zombie on Tuesdays and Thursdays. Life could be worse, though. I could be Bauer-less instead. Now, for some traffic math. Google Maps says the station is exactly 30.4 miles from my apartment, which means I drive 60.8 miles roundtrip. Twice a week equals 121.6 miles per week. So that means, in one month, I have driven FURTHER THAN DISNEYLAND. Yet, I haven't seen Mickey since 2005. Something is wrong with that. I have eleven weeks left. When my internship is over, I will have driven approximately 1,824 miles. That's equivalent to driving from here to Tallahassee. But things could be worse. At least my 60 mile commute doesn't involve ice and crazy Utah drivers. Oh the ice and the Utah drivers--the pedestrians are what kill me in the morning... or maybe what I want to kill in the morning. And hubbies definitely need kissing. Mine gets sad if he doesn't get enough attention. Brave, brave Dill. Maybe you should visit Mickey after this is all over. I think that would be a great idea. You are a brave woman. That is a long drive. My mileage is almost exactly half of yours and I thought that was bad. I'm so glad they are letting you do it for two days instead of all week. Can you imagine driving that every day? EEK! HAHAHA i love your blogs. every last one.